Arniel Gane, a Breton conjurer, is one of the scholars at the College of Winterhold. He specializes in the art of Alteration although most of his time is spent on research entirely unrelated to the arcane arts, something he keeps a secret from everyone until you have completed Hitting the Books. At that point he reveals his secret and asks for your help to uncover one of the greatest mysteries in Skyrim history. He lives in the Hall of Attainment, in the first room on the right on the second floor, and sleeps there every night between 4am and noon. He then dedicates the entire day to his secret studies and stays in his room. At 8pm he seeks out his friend and colleague Phinis Gestor who will be in the Arcanaeum. At 11pm Arniel returns to his quarters and strolls around until bedtime. There are several exceptions to this routine, as he will participate in several quests related to the discovery of the Eye of Magnus. See this section for details. He wears adept robes of Alteration and a pair of boots. He is a very skilled mage and knows numerous spells, including Ironflesh, Dread Zombie, Revenant, Frost Cloak, Ice Storm, Icy Spear, Lightning Bolt, Close Wounds, Grand Healing, Greater Ward, and Steadfast Ward. When you first join the College as a mere apprentice, Arniel Gane will be secretive about his research although he hints at something very big: "I'm working on some very important research, I assure you." and "The exact nature of my research is a secret, I'm afraid, but it really is quite valuable." Unfortunately, nobody cares about his important research: "I don't think anyone here truly understands how useful my work will be." and "When I've finished what I'm working on, everyone will understand its significance." Even if he sounds like he could use a hand, he will not share his secret with you: "You mean the official sort of business? Hmm, well... no. No, not really." He will then close the conversation without revealing anything else. As you progress through the College quest line, Arniel will share several opinions on the strange and sometimes tragic events that unfold. 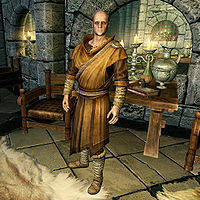 Like everyone else, he is not too fond of Thalmor advisor Ancano: "He's asked far, far too many questions about my research. I think the Thalmor are trying to steal my work! I haven't told him anything, of course. What I'm doing is far too important. Can't breathe a word of it." During the quest Good Intentions you can also ask him how to find the Augur of Dunlain: "What? The Augur? Oh no, I'm quite sure that's... He's nothing I'm involved in. No, no. Mirabelle Ervine... Or Tolfdir. They're qualified to discuss him. Not me, definitely not." Also, as the College quest line progresses, he will become more and more nervous, greeting you with: "I can't lose all my research. There has to be a way to save the College. ", "I hope you know what you're doing. ", and "I'll be amazed if any of us survive this." The first time Arniel Gane ventures outside the College is when Tolfdir suggests that you and the other apprentices help out with the excavation of Saarthal, one of the oldest ruins in Skyrim. At that point Arniel will be teleported to a spot inside the excavation site. Once you have entered, ask Tolfdir what you can do to help and he will say: "Ah, yes. Hmm. Well, why don't you see if you can assist Arniel Gane? He's one of our scholars, here working on cataloging our finds. I expect he'd appreciate some help in locating any additional magical artifacts here in the ruins." When asked again he will repeat: "Find Arniel Gane. He's somewhere in the northern section of the ruins. He'll show you what to do." Arniel will wander around in the northwestern tunnels of the site, seemingly unengaged, still researching his secret project by reading a book. When approached he will say: "Well, certainly none of this will benefit my research...", and will be skeptical about the whole affair: "I'll be amazed if we find anything useful here." and "It's going to take forever to sift through all this." If you have talked with him before at the College he will greet you with: "What? Ah, yes. You. I remember you. You're going to help? That's fine. Just... Just don't make a mess of my work." Alternatively, he will greet you with: "You must be one of the new apprentices, then? Fine, fine. Just... just don't make a mess of my work, all right?" He will then continue: "I've only looked through a portion of this section. You, uh, you can look around in the chambers just north of here. Try and be careful, all right? We don't want to damage anything." You will now be tasked with a mini-quest of finding four magical artifacts. When asked again, Arniel will repeat: "Just round up the rest of the magical artifacts so that I can catalog them." 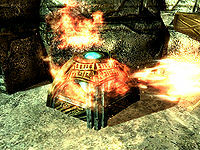 When you pick up the Saarthal Amulet, you will be trapped and Tolfdir will panic while Arniel will remain unaffected. Once you have broken the barrier, you can head back to Arniel and hand him your findings. Once again, he will be uninterested but will take them back with the words: "I see. It probably doesn't even matter now, what with the mess that's been made in here. I'll add this to the rest of the items. I don't think there's anything further I need from you." Arniel will then stay behind while you and Tolfdir investigate the rest of the ruin leading to the discovery of a very mysterious orb. When the quest is completed, Arniel will travel all the way back to the College on foot, a trip that takes him over four in-game hours. Once you have completed Hitting the Books, thus gaining respect from the members of the College, Arniel Gane will be ready to share a very little bit of his secret and admit he could use some help: "You mean the official sort of business? Hmm, well... no. No, not really. But... I can't help but notice that you're doing quite well for yourself, rising through the ranks and all. It may not be 'official', but there is a, uhh, project I've been working on. I wonder if perhaps you could assist with it." He will, however, not really share any secrets; he just wants your help. Two options are available. When asked if he wants to tell about his project he will say: "Ah, yes. Umm, no. No, I don't think so. Not at this point. It's just that, well I'm not even really sure it's going to amount to anything just yet. All theoretical right now, you understand. But the implications are quite intriguing, I think. I simply need some experimental results to confirm my suspicions." If you instead ask him if he is involved with something dangerous he will decline: "What? No, no. Goodness, no! At least, I don't think so. No, it's just... It's just something I'd prefer to keep to myself." Both options will lead to his first request: "Just... Just bring me some Dwemer cogs. I need to examine them for the methods used in forging them. Ten of them should be enough for me to get a better understanding of how they were crafted. That's all I need, all right?" 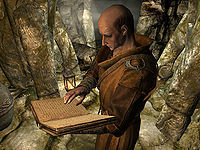 When asked about the task again he will reveal that he is secretly studying the ancient Dwemer: "I simply need more pieces of Dwemer equipment to study. It's nothing dangerous... At least, not necessarily. And please, let's just... Let's keep this between us." This starts Part 1 of the quest Arniel's Endeavor. When you return to Arniel with the ten Dwemer cogs he will be happy to see his project getting underway and say: "Ah, that's excellent news. This will be most helpful in furthering my research. I'm afraid I can't offer you much right now, but please take this. And perhaps, if this is all successful... Well, let's not get ahead of ourselves. It's too early to be getting excited. Still, this is most encouraging. Thank you again. If I require anything else, I shall be sure and let you know." This concludes part 1 of the quest and you can start Part 2 right away. Nirya: "What are you up to, Gane? Hmm?" Nirya: "Some days I marvel that you haven't managed to blow yourself up." Nirya: "Don't even talk to me, Gane." Arniel: "Ah, err, yes. Sorry." While things turn bad elsewhere in the College, Arniel Gane will offer you the next task right away, starting Part 2 of Arniel's Endeavor. When asked if you can offer further assistance he will say: "As a matter of fact, there is something you can do for me. I had retained Enthir's services in, uhh, acquiring something specific. But now he's refusing to deliver. Could you perhaps speak with him, and see if we can come to some sort of arrangement?" 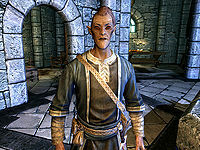 Enthir, a Bosmer with very strong ties to the Thieves Guild, lives on the same floor as Arniel. Confront him with Arniel's claim and he will say: "Oh dear. He's so afraid to talk to me he's sending you to do it? I should've expected as much. I'm afraid you've been a little mis-informed. I have something of mine, that I was going to sell to Arniel. I told Arniel what I wanted in exchange for it, and he was unwilling to come up with it. Now, if you're here on his behalf, I'm afraid I'm going to have to insist on my original payment." He then reveals that you need to acquire the Staff of Tandil to exchange whatever it is Arniel is after. When you return with the staff, Enthir will be pleased and say: "Well, well. All right, you delivered on your end, so I'll deliver on mine. Here's the gem Arniel was after. Can't imagine what he expects to do with that... it's warped beyond any ability to capture a soul." He then hands you the Warped Soul Gem and finishes the conversation. When you tell Arniel you have the soul gem, he will be excited to see his research continued, although he will still not reveal a thing: "Do you? Wonderful. I was afraid I'd have to give up, and when I'm so close... Thank you for this. I have a great deal of work ahead of me." This finishes Part 2 of the quest and, if you have yet to complete the College quest line, an entirely new story for Arniel. "Come on, Arniel. Let's go." The quest Revealing the Unseen ends with a big bang. Ancano's obsession with the Eye of Magnus causes a tragedy as Arch-Mage Savos Aren dies from the explosion. As you enter the courtyard, most of the members of the College will stand and look at the dead body in disbelief. 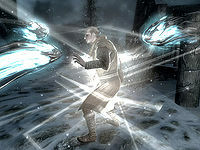 Before long, Tolfdir will take control and order you to protect the city of Winterhold from the aftermath of Ancano's action. When you reach the bridge you will find a confused Arniel along with Faralda. After a brief conversation with Faralda, Arniel will only say: "What have we gotten ourselves into now?" before he runs towards Winterhold. Along the way, Faralda will notice the hesitating Arniel and will yell: "Come on, Arniel. Let's go." and Arniel will respond: "Do we have to? They'd never lift a finger to help us." 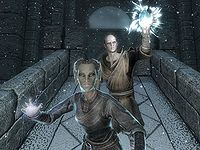 On the main street of Winterhold, Arniel will finally show what he is capable of and will use all his magical skills to defeat the magic anomalies that float around. When all is said and done, Arniel will stretch and comment: "Well, this certainly won't help our image." He will then stay behind and make sure the town is safe while you go talk to Mirabelle Ervine back at the College. When the quest The Staff of Magnus is initiated, Arniel will be back in the College, scared: "I can't lose all my research. There has to be a way to save the College." and "I hope you know what you're doing." He will not say anything else, so you will have to complete The Eye of Magnus before you can help him any further with the research. After the events with the Eye of Magnus and Ancano, you will be Arch-Mage and Arniel will have gained so much respect for you that he is ready for Part 3 of Arniel's Endeavor and will finally reveal the truth. When approached he will ironically reflect on the recent events at the College: "Perhaps we can go another few decades without a disaster. That would be nice." When asked how the project is going he will be quite upset: "Terrible, just terrible. I vastly underestimated the heat transfer necessary, and have destroyed my only working model. I'm at a loss." Two options are now available. If you attempt to make fun at him he will angrily say: "Don't patronize me!" If you tell him you have no idea what he is talking about he will say: "Look, it's all very simple. The Dwemer, they were uhh, masters of magic in a way we can't even begin to conceive of. Their greatest achievement, however, has also been their greatest, shall we say... Mystery." Although you once again have two options he will get to the same point if you comment on how the Dwemer have been gone for a long time: "Precisely! What could be worth studying about a long-lost civilization? Their disappearance, of course! Instant, unexplainable. The stories have fascinated me... Ever since I was young, I wanted to know what really happened. After years and years of work, I'm closing in on a way to investigate what happened through experimentation. Only now... Well, it's simply a disaster." He will then explain his complex research: "Without boring you with the, ahh, details, I am attempting to re-create the circumstances of the event. The dwarves were very clever, tapping into and drawing power from the Heart of Lorkhan itself. Lacking the heart of a dead god myself, I was attempting to substitute a rather specific soul gem. The ahh, the one you helped me acquire." He will then answer your question on why the soul gem won't work: "Well, yes. I mean, no. That is, it might, but I'm not completely sure. I'm no tonal architect, I've only read their writings. Scraps, really. The soul gem by itself isn't enough, you see. It needs to be altered, purified. The dwarves had machines for this sort of thing. I attempted to build my own, based on designs and using parts you helped to provide. My very own Dwarven Convector. It worked, but not fully. And the uhh... The device was destroyed in the process." If you suggest he should build a new Convector he will be annoyed: "Hmm? No, no. No! I'm too close now. Can't take the time. Though... Perhaps there's another option. I, umm, I may require further assistance from you." Two options are available, one of them the greedy route, asking him what you will get out of helping him: "Well, I... Don't you see? Unlocking this mystery... The story alone is worth more riches than you can even imagine. And perhaps... well, I don't wish to speculate, but... What if we could contact the dwarves? What if they're still out there? Imagine!" He will then tell you what needs to be done: "Well, yes. The designs for my Convector were based on real dwarven machines, so there may still be some in existence. I'd go looking myself, but uhh... Yes, there are calculations to double- and triple-check. Many calculations. 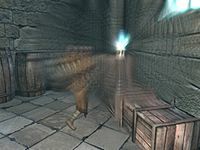 Perhaps you could seek out these Convectors in Skyrim ruins? I can even teach you the spell to heat them. It's very particular, and very important." When you accept to learn the spell Arniel's Convection he will happily say: "Wonderful, just wonderful! I knew I could count on you! Now this spell is not for defending yourself, but it's just right for heating the Convector. At least three seconds' burn is necessary. Just place the soul gem inside, and heat the Convector. At least three seconds. You'll almost certainly need to find multiple Convectors. I suspect it may be due to the nature of the soul gem versus the crystals this was intended for. Destroys the equipment in the process. But, ahh... It's effective. Three times, and the crystal should be ready for the next step. Isn't this exciting?" He will then exit conversation and the quest will start. 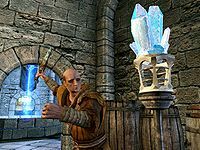 When you return with the altered soul gem, Arniel will have a new, and very grateful, greeting, ready for you: "Divines bless you. May the ground you walk quake as you pass." When you tell him you have his gem, he will be surprised: "It worked, then? Let me see! Goodness, that's it, isn't it?! Yes! It's not perfect, but it's a close enough approximation that it should certianly [sic] suffice for initial tests! You've done excellent work here. Truly excellent. There's only one thing missing now, and that should be arriving shortly. I'll begin preparations. Thank you again so much for this." This concludes Part 3 of Arniel's Endeavor. After a few days time, Arniel will have relocated to the storage room on the second floor of the Hall of Countenance and will be ready with his last task, Part 4 of Arniel's Endeavor. When confronted with the question of if he has unraveled the mystery yet, he turns out to be very angry: "No, and at this rate, I never shall! Enthir is once again holding out on me. He refuses to deliver yet another item absolutely essential to my work! I am close, so close! You must force him to see reason!" He will, however, have no clue how to persuade Enthir: "I don't know, I don't know! I've already agreed to pay him quite handsomely for the... well, the item in question. Just... Do whatever it takes to get him to stop lording this over me." When you confront Enthir he will once again reveal that Arniel told you the wrong story: "Oh, by the Divines, you too? I've already told him. I don't have it!" Enthir proceeds to explain that Arniel's 'thing' was supposed to be delivered by courier, but never showed up from Morrowind and that there is little he can do about it. When asked about what the 'thing' is, Enthir will reveal that he never got an explanation either: "I don't know. He never told me. He made most of the arrangements himself, he just needed it transported from Morrowind. That's what I agreed to help with. If I'd known it was so important to him, I'd have charged him more." Enthir only knows that the courier was on his way through Eastmarch when he disappeared. While optional, it is possible to return to Arniel and tell him the news: "What? I... I don't understand. Where is it?" Two options are available. Tell him that it disappeared after leaving Morrowind and he will get scared: "No, no no no. This can't be happening." Tell him that the courier never arrived and he will say: "He has some simple-minded courier delivering it?" Both choices will lead to him saying: "It can't be lost. It just can't! It's irreplaceable, do you understand? Without it, I cannot finish my work. All these years, so much time, so much energy... You must find it! It cannot end this way! Not after I've worked so hard!" You can try and squeeze more information out of him but he will not reveal what you are looking for: "It... It's very valuable. Critical to my work, and one-of-a-kind. That's all I care to say for now." You can also try and ask him if he made it clear to Enthir how valuable the item was: "Have you lost your mind? Think, please, just for a moment, about what he would do if he knew its true value. Do you really believe he would honor our agreement, or go running off to the highest bidder? Please, you must set this right. I'm begging you." So you have everything you need now? "I do... I do indeed. Keening, one of the great tools of Kagrenac himself, is finally in my possession. I don't think I really believed this day would come." What's the big deal about this dagger? "Now we see whether my theories are correct. I apologize if I have not been clear about my work. I didn't want to discuss it for fear this moment might never come. Everyone knows the dwarves disappeared. No one knows why. This little experiment is a first step in recreating the events of their disappearance in an effort to unravel that mystery. Lacking the heart of a dead god, I am substituting the crystal you helped craft in its place. I also lack Sunder, the counterpart to the dagger Keening. I am reasonably, confident, however, that this will still work. I certainly don't expect it to have quite the same results. I'm no tonal architect, of course! Well, I suppose it's time, isn't it? Let's see what happens. You, uhh... You may want to stand back a step or two. But please, don't leave. You've been instrumental in this process. I'd like you to see the results first-hand. Right, then..."
He will then draw the dagger and take a stab at the warped soul gem, with no result: "Hmm. That... That didn't really do anything, did it? Perhaps a little harder?" Two more stabs will still yield no effect: "I don't understand. This should produce some notable effect." He will then get upset and start shouting at the soul gem: "Work, damn you!" He will then run amok and stab the gem several times, until a flash of light appears and everything goes quiet. Arniel is nowhere to be seen and Keening lies on the floor. The quest will end and the unique spell Summon Arniel's Shade will be added to your magical skills. Apparently, Arniel solved the great mystery of the disappearance of the ancient Dwemer, but went to the same place as them, taking the mystery and its solution with him. This great discovery will go completely unnoticed at the College – because nobody will even notice that Arniel is gone. "You found what? Hmm. Well now. Yes, this might actually be something interesting. You'd better show that to Tolfdir right away." "You found what? Hmm. Well now. This is all very fascinating, but I don't recall asking to you to touch anything in here. I suppose you'd better show that to Tolfdir nonetheless. And please, ask before tampering with anything else." Arniel will never initiate dialogue with his fellow College members, as all the scenes were set to take place in the Hall of Countenance where none of them will ever meet. Despite being a conjurer, when he is forced to fight, he tends to use his fists only, although he will reanimate weak corpses if they are available. Should he find a weapon to pick up, he will keep it equipped for the rest of the game. This page was last modified on 31 July 2018, at 00:44.